Say what you want about Greg Roinson as a head football coach, but throughout his four years as head man of the Syracuse football program, I have never heard anyone – from the players on the team, to athletic director Daryl Gross, to other coaches around the country – question Robinson as a person. And that’s why even the most bitter SU football fans should be happy for Robinson after the Orange’s 24-23 comeback win over Notre Dame last night. For anyone who watched the game on national television yesterday, there was no question how hard the team was playing, and just how excited the team was to win. I’ve heard some people say they expect the Orange to play hard the rest of the way just to attract a potential replacement for G-Rob, but part of me honestly thinks the team was playing for its lame-duck head coach. Not necessarily to help him win his job back, which is out of the question, but out of respect for Robinson as a man. Who would have thought coming out of this game the opposing head coach would be the one hearing the critcism? Charlie Weis, who started at Notre Dame the same year Robinson took over at SU, is starting to feel the heat after last night’s unthinkable loss. There’s a good chance if Weis didn’t have a $20 million buyout, he would be shown the door at season’s end. With just two games left to go this season, and with a 2-8 record, there’s not much for the Orange to play for this weekend at Notre Dame, even if the Orange wants to make Syracuse seem like an attractive place for a potential replacement for lame-duck head coach Greg Robinson. But for quarterback Cameron Dantley, the game this weekend in South Bend will certainly mean something. Dantley is the son of NBA Hall of Famer Adrian Dantley, who played his college basketball at Notre Dame under current ESPN analyst Digger Phelps. And, while Cameron expects his father to be rooting for him on Saturday, he admits it might be tough. 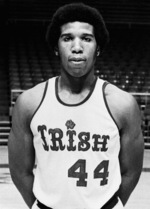 Adrian Dantley averaged nearly 26 points a game for the Irish during his career. That is good for second in Notre Dame history behind Austin Carr, who averaged a whopping 34.6 points per contest.